We all want to fit in, and feel that we belong. Rhino Neil certainly does. The problem is, many of the other zoo inhabitants are daunted by his size. "Look out for his tremendous tummy," said the zebra. "One bite and he will swallow us all up!" And she told all her children to stay well away from Neil. Written and illustrated by Mini Goss, and published by New Frontier (2007), this children's picture book is a delightful look at the nature of friendship, and the consequences of intolerance.Young children will perfectly understand Neil's need for a friend, and wonder what can be emerging backwards from the truck. Mini Goss captures the animals' hysteria perfectly. My favourite picture is a double page spread of silly ostriches goggling at, and terrified by the huge bottom that backs out of the truck. Goss's acrylic art work is quirky and colourful, perfect for the under eights. There are some useful learning activities related to Rhino Neil at New Frontier's website, including discussion questions and a design project. Children could use Rhino Neil as a jumping-off point to fact finding about the animals in the book. If you'd like child-friendly information about this odd-toed ungulate (the order rhinos belong to), try a Kids Planet fact sheet, and check out their games while you're there. A visit to Switcheroo Zoo might even spark some writing of their own. National Geographic has some fascinating information about the Black Rhinoceros, including an excellent close-up video. 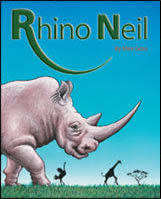 Rhino Neil was selected as a CBCA Notable Book for 2006, and selected for both the Victorian and NSW 2007 Premier's Reading Challenge.